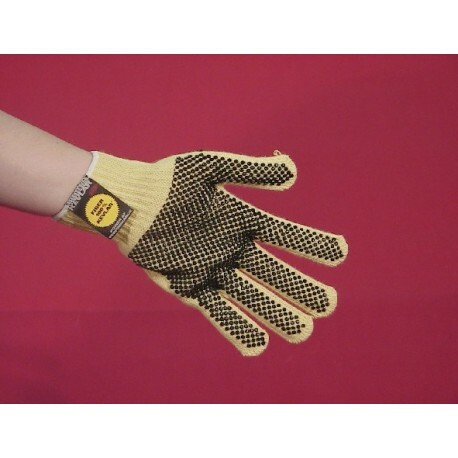 SAF-T-CURETM KEVLAR GLOVES protect hands from cuts, slashes and abrasions when working with steel rule dies. Made of tough and cut-resisitant Kevlar fibers. Open mesh knit stretches for a comfortable fit. Reversible, left or right, to maximize wear. PVC dots for a sure grip. 12 pairs/pack, 12 packs/case. HEAVY USE: Recommended for handling sharp blades and steel rule dies. Excellent for long periods of repetitive use. Daetwyler Kevlar Gloves [I004-170]: Durable, cut resistant gloves are a must in every pressroom. Made from Dupont Kevlar fibers, these comfortable, lightweight gloves allow for manual dexterity and offer excellent protection.